The Heritage Foundation recently came out with an updated ranking of countries’ economic freedom. Heritage is focused on creating laws that encourage economic freedom, by which they mean low taxation, open trade policies, and few barriers to start a new business. We mapped Heritage’s scores from the freest countries in the world (in green) to the most repressed (dark red). This lets you easily see the best (and worst) places to live when it comes to making your own financial choices. 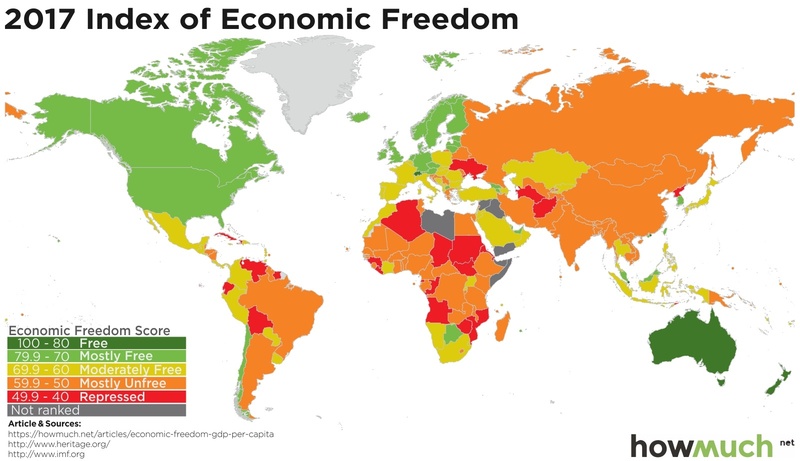 Looking at a map of economic freedom for the entire world reveals distinct pockets of freedom and repression. The freest continuous group of countries stretches from the United States and Canada over to northern Europe and the Baltic countries. Russia is the only country touching the Arctic Ocean in a color other than dark and light green. Australia and New Zealand also stand out in the Pacific as bastions of freedom, especially combined with the other countries in Southeast Asia. On the other hand, almost all of South America, Africa, and Asia (at least on the continent itself) remain repressed. Searching for patterns across the entire globe is interesting, but we thought we could take our viz up a notch and see if there are any correlations according to average GDP per capita and economic freedom. Gross Domestic Product (GDP) is a simple economic measurement for the total value of the goods and services sold in an economy. Looking at GDP per capita is not the same as average income, but it lets you quickly judge how well off the average person in that country is. So we used GDP figures from the International Monetary Fund to change the size of each country on the map—the larger the country appears, the higher per capita GDP is. There are some surprising insights you can gather from crunching the numbers like this. First off, the United States is obviously the richest country in North America with a GDP per capita of $59,609, followed by Canada ($43,611). 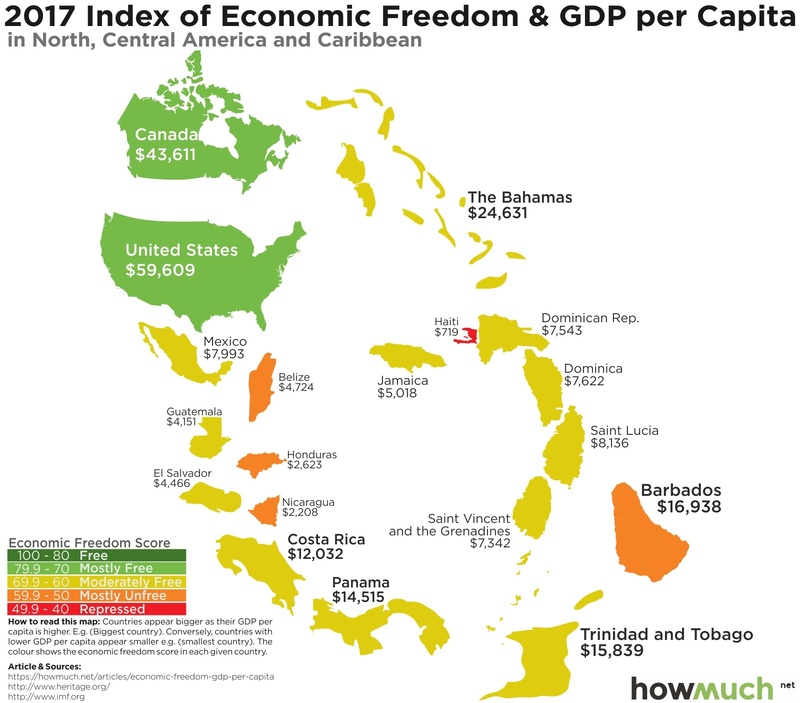 Every other country is either moderately free or mostly unfree, and third richest country in the bunch is actually The Bahamas ($24,631) followed by Barbados ($16,938). But look at how small Mexico appears, where GDP per capita doesn’t even reach $8,000. That fact alone tells you a lot about the Mexican economy. Moving down to South America reveals other interesting trends. Chile is the freest country around, scoring a respectable 76.5 in Heritage’s ranking, but it only has a per capita GDP of $13,663. 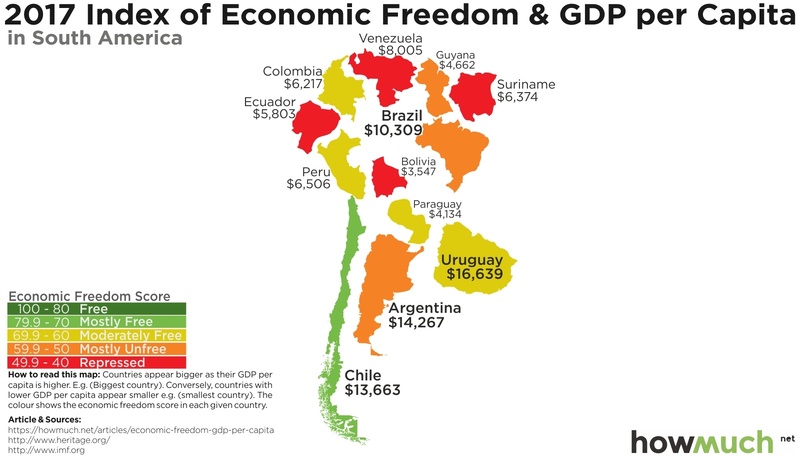 Two other countries are comparably less free but richer: Uruguay ($16,639) and Argentina ($14,267). This is our first clue that economic freedom is not a surefire guarantee for a wealthy economy. Crossing the Atlantic Ocean into Europe reveals a significant amount of economic freedom with several developed and rich economies. Luxembourg blows away the competition in terms of its GDP, boasting $101,715 in economic output per citizen, followed by Switzerland ($78,245) and Norway ($73,450). Not everything is so great across Europe, however. Several countries along the Mediterranean remain only moderately free, with other countries in Eastern Europe along the Balkan Peninsula generating comparably small economic outputs. 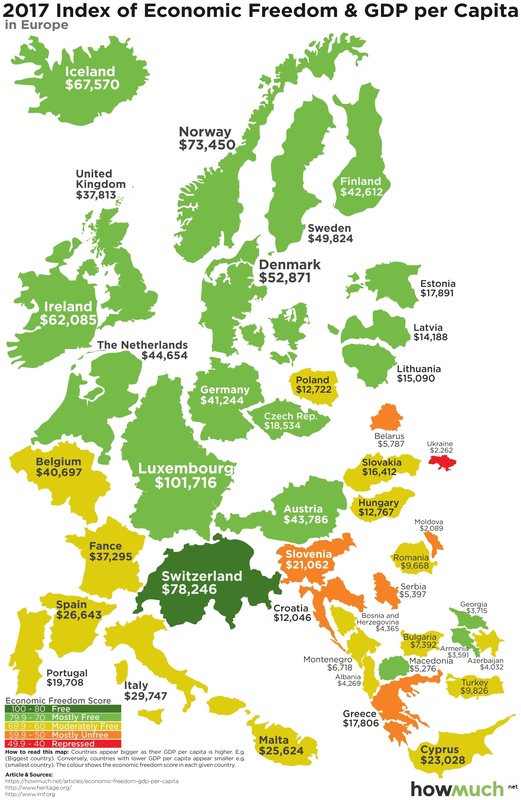 Greece is an interesting place our map given the recent news about its debt restructuring. It still has a per capita GDP of $17,806, which certainly isn’t the best, but its about the same as Portugal. There is yet hope that the Greek economy can muddle its way through. For the purposes of this map, we define Asia as the entire continent stretching from Israel in the East all the way to Indonesia and Taiwan in the West. There’s a tremendous amount of diversity in this region, both in terms of the relative freedom of these places and the size of their economies. Hong Kong ($44,752) and Singapore ($51,431) are the two standout countries with the freest citizens. We should mention that both countries inherited their current government and legal systems from their historical legacy as British colonies. 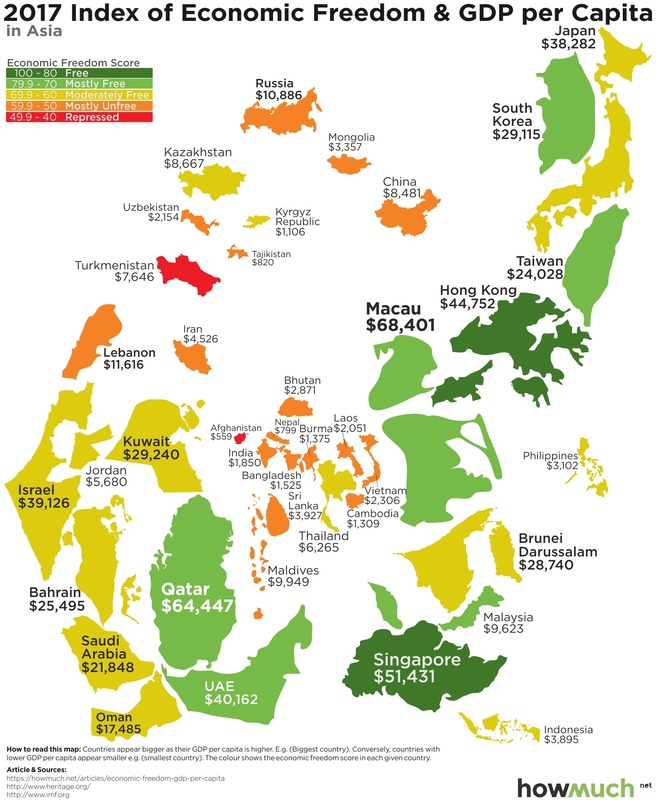 Macau actually has the largest economy for its size ($68,401) thanks to a robust gambling industry, while Qatar ($64,447) and the UAE ($40,162) make the list thank to their oil wealth. Every other country across the Middle East still has a long way to go before joining the ranks of economically developed countries. The situation is Africa is quite different from the rest of the world. Looking at our map, you can immediately see a large number of repressed or mostly unfree countries with tiny economies. Seychelles actually has the largest economy for its size with a GDP per capita of $15,578, but its not technically in Africa (it’s actually in the middle of the Indian Ocean). Equatorial Guinea ($13,867) is the wealthiest on the continent itself, but the country scores extremely low on Heritage’s ranking at 45.0. 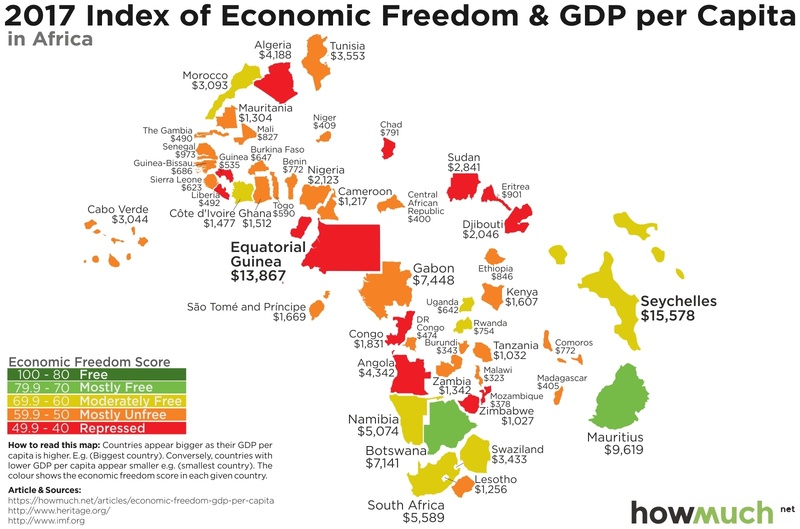 Mauritius ($9,619) and Botswana ($7,141) are the freest countries around, but their economies are still puny in comparison to almost everywhere else in the world. Oceania is the last stop on our world tour, and you can clearly see a dichotomy between Australia and New Zealand and the rest of the region. The Auzis have the most robust economy with a per capita GDP of $55,215, roughly $14,000 higher than New Zealand. There’s simply no other place in the region with nearly as much wealth or economic freedom. Fiji is the only other island to cross $5,000 in per capita GDP, scoring only 63.4 on Heritage’s rankings. Let’s break this down one more way. Take a look at the top ten freest countries on Earth. We also listed Heritage’s freedom score and the GDP per capita as a quick reference. As you can see, Estonia and Chile both crack the top ten, but they don’t exactly have high performing economies. The things that the Heritage Foundation measures for economic freedom only tell part of the story in terms of economic development. Countries also need to get lucky in terms of geography (like the United Arab Emirates) or historical legacies (like Hong Kong and Singapore).